Morning sickness is a ridiculous name for it. It does not occur only in the morning. In fact, sometimes it occurs every time except the morning. Really it should be called “anytime, anywhere, it will find you sickness.” There is no rhyme or reason to it. Sometimes it hits you when you’re hungry, sometimes when you’ve had too much to eat. Sometimes it’s a smell that will send you over the edge. Sometimes it is because you’ve eaten something that didn’t sound too appetizing but you were just so hungry, and sometimes it is because you’ve eaten something you’ve been craving and it was the most delicious thing you’ve ever tasted. I have been battling morning sickness for the past few weeks. I’ve been struggling to keep much down besides cheese and crackers. Some days I feel so defeated because I haven’t kept anything down all day but I’m so hungry (because I haven’t kept anything down all day!) I know if I don’t eat I will get too hungry which will make me gag and throw up nothing, however I know if I eat I’m just going to actually throw up. My tastes change daily so there is really no way to know what is a safe bet, but it’s kind of fun to experiment and try different combinations of food throughout the day. In all honesty, the puking isn’t horrible. I try to drink TONS of water so it’s not quite so painful if I do wind up bent over the toilet and I usually get a little bit of relief after ralphing, albeit temporarily. The other side effect, that I would gladly pass up, that comes along with the consistent vomiting is the lack of bladder control. When I’m bent over puking, my body tenses so much each time I wretch that I pee. It’s like being kicked when you’re down. It doesn’t happen every time I puke, but when it does…oh boy. So then, I’m puking, and peeing, and then I start crying because….because….hormones, dammit. Because sometimes you just want to throw your hands up and say “seriously?” But really, by the end of the whole fiasco, I’m usually laughing because really what is more funny than seeing a pregnant woman puke and pee herself at the same time and then start crying? Exactly. I’m usually laughing because one, or both, of my girls will come in and watch and ask me what’s wrong. My youngest will ask, “mommy, why are you throwing up and why did you pee your pants?” Sometimes I respond, “well baby, mommy was bored and just wanted to add a little excitement to her day!” Other times I’ll say, “mommy was trying to give herself a reason to do some laundry.” What else are you supposed to say to a three year old? I’m 9w6d. 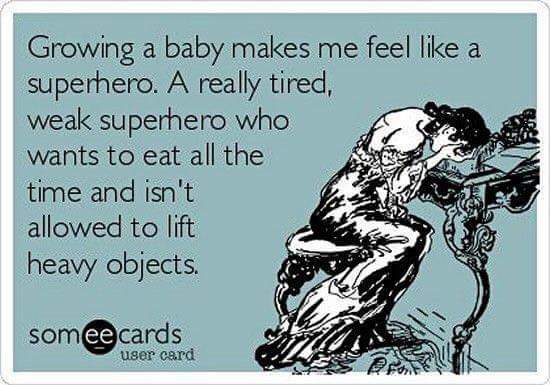 14 weeks is second trimester and I’m hoping for some relief. Don’t get me wrong, I am NOT complaining. Even after all of this, I would absolutely go through it all again to help my IPs grow their family. Getting to see the joy and excitement on their faces at each ultrasound makes everything worth it. And if you can’t laugh at yourself when you’ve peed your pants, you aren’t really living! Feel better! Is there nothing else Dr. can do to give you relief!